Chickpea A492401 — Pen 52 — ADOPTED 2/3/2008! Chickpea was adopted by a great young couple who just fell in love with her. People say I look like a pirate with my black eyepatch. It’s true that I’m trying to steal your heart. I’ve been at the shelter for over 2 whole months now, and I really want to find my forever home. I’m a favorite of the volunteers here and they take good care of me, but it’s just not the same as having a family to call your own. I’m a happy-go-lucky girl who’s always ready for some fun, whether it’s playing fetch in the backyard or showing off my great leash manners on the trail where I’m already a regular. Are you looking for a girl like me to complete your family? Chickpea likes to play rough! 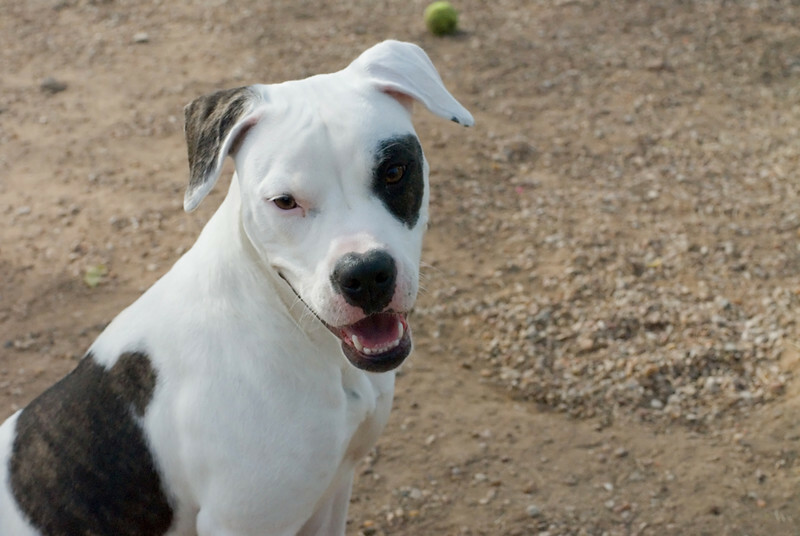 Consider your dog’s play style if considering her for adoption. 2/3/2008 Update. Chickpea went home with a lovely young couple today. We are thrilled. 1/19/2008 Update. Oliver and Chickpea have become playbuddies. See additional video of their playsession in Oliver's album. Photos courtesy of Lisa Bradley.